Stay true to your spirit, no matter what. A striking new front grille and bumper assert the Swift Sport’s stinging, distinctive style. Dual exhaust pipes convey potent engine performance. Sharp, passionate design stirs the senses of drivers to go beyond conventional boundaries. A stinging-hot sensation that races through the body. Crisp manoeuvrability and responsive control. Wholly reborn – from sporty drivability all the way to safe, practical performance. Introducing the new Swift Sport – a “hot hatch” that excites to the max. The interior makes a strong design statement. Decoration panels are graded from red to black. An exclusive meter cluster stands out with two separate colour arrangements: a red dial face of the tachometer and a dark silver face of the speedometer. Boost/oil temp gauges on the centre 4.2-inch colour display turn up the spirited look. Semi-bucket seats with red stitching are comfortably sculpted to provide ample lateral support and stiffness that optimise your feel for the road, even in high-speed turns. A dimpled D-shaped steering wheel and gleaming stainless steel pedals add to the vehicle’s ultimate sportiness. Distinctive hot hatch performance is embodied by highly responsive acceleration, made possible by the exclusively tuned downsized turbo engine’s powerful 230 N・m torque. Such performance is perfectly complemented by a smooth-shifting six speed manual transmission. 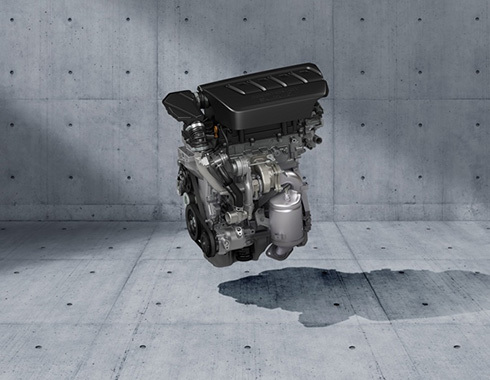 The powertrain’s great refinement opens the way to the next stage of sporty driving. The new 1.4 BOOSTEJET direct-injection turbo engine evolves the torqueful driving of the new Swift Sport. The intercooled turbocharger forces pressurised air into cylinders and enables the engine to maxmise torque in the low engine rev range, even at 2500rpm. Moreover, the wastegate valve controls turbo boost pressure by opening or closing the gate, dramatically quickening response and lowering fuel consumption. The direct injection system further enhances fuel efficiency by optimising control of the amount, timing and pressure of injected fuel in direct fuel injection. Danger lies where a driver loses control. That’s why Suzuki Safety Support enhances safety in emergency situations and supports safer driving through various functions. The new Swift Sport offers optional Dual Sensor Brake Support (DSBS) and standard Radar Brake Support (RBS). DSBS combines a monocular camera with a laser sensor and includes safety functions such as collision mitigation braking, lane departure warning, lane departure prevention, weaving alert and high beam assist, while RBS utilises millimetre-wave radar for collision mitigation braking and adaptive cruise control function. *In cars equipped with both DSBS and RBS, collision mitigation barking is employed via DSBS. When moving, the new Swift Sport uses two sensors – a monocular camera and a laser sensor – to determine if there is a risk of collision with a forward vehicle or pedestrian. Upon detecting a potential collision, the car acts in any of the following three ways. At 40km/h or faster, high beam assist is designed to automatically switch the headlights between “High” and “Low”, depending on the presence of other vehicles and the lighting environment. At 60km/h or faster, the lane departure warning is designed to predict the path of the vehicle and issue visual and tactile warnings to the driver. During the speeds of 60 to 160km/h, the lane is recongnised via a monocular camera. When interpreting that lane departure is likely to occur, the car automatically assists the driver in returning the vehicle back into the lane by controlling the steering via the electric power steering system. At 60km/h or faster, the weaving alert is designed to calculate the driving pattern and issue audio and visual warnings if the vehicle is “wandering” due to driver drowsiness, etc. When moving, the new Swift Sport uses millimetre-wave radar to detect the vehicle in front. 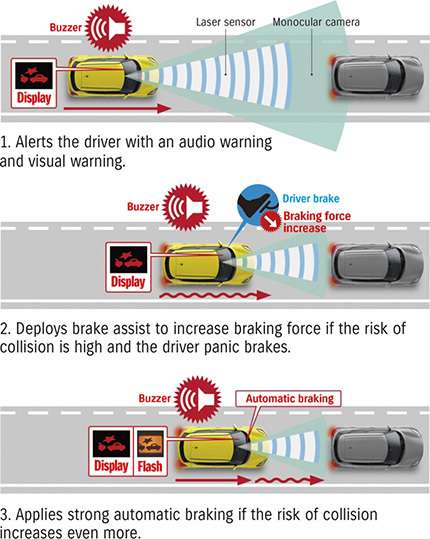 Upon detecting a potential collision, the car acts in any of the following four ways, depending on the situation. 1.Alerts the driver with a warning when there is the possibility of a collision. 2.Alerts the driver by applying a light brake. 3.Supports the driver’s braking by increasing braking force. When there is a vehicle in front, the ACC uses millimetre-wave radar designed to gauge the distance to it and automatically maintains vehicle-to-vehicle distance in line with the setting selected out of three possible settings*. When there is no vehicle in front, it maintains the speed set by the driver. *The vehicle-to-vehicle distance varies depending on vehicle speed. *There is a limit to the ability of a monocular camera, a laser sensor and a millimetre-wave radar sensor to detect obstacles and lanes, and control the vehicle. Do not rely too much on the system and always drive in a safe manner.